This month our featured 'Real Wedding' is Hannah and Nick who got married at Willington Hall, in June. 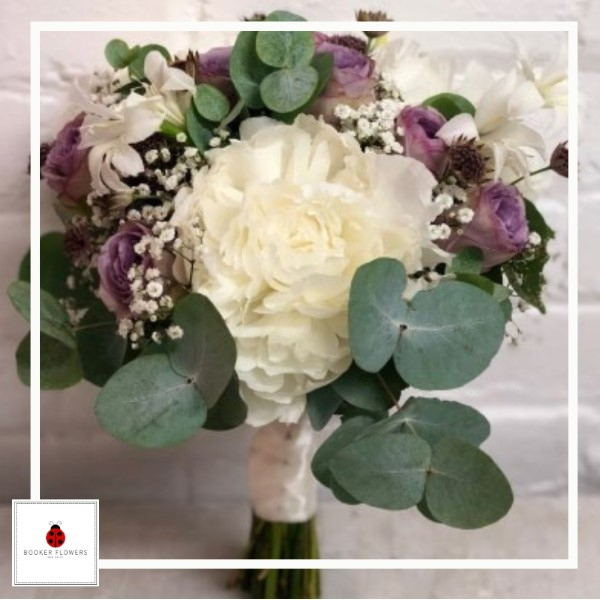 Hannah held a gorgeous Bride hand-tied bouquet of lilac lullaby roses, white peonies, gypsy grass, astrantia, wedding gladiolus and eucalyptus and her bridesmaids had similar smaller hand-tied bouquets containing the same flowers. Lilac lullaby roses were also used for the buttonholes and corsages. 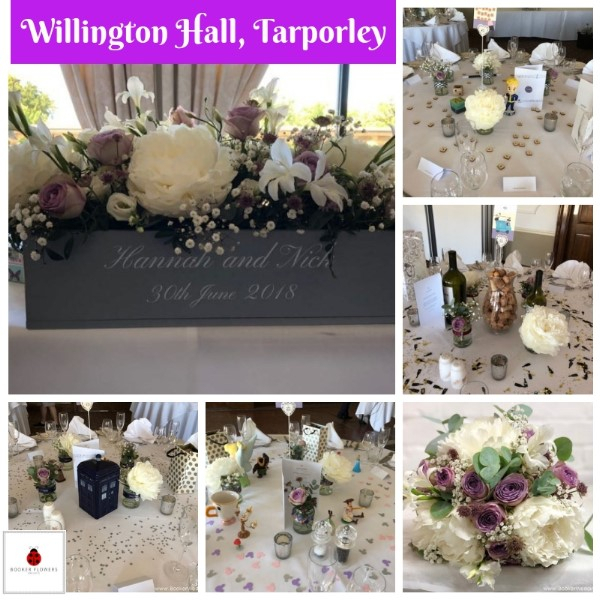 Rather than having table numbers, Hannah and Nick personalised each table with something relevant to them, which we thought was a lovely touch and we added flowers to Star Trek, Disney, Wine, Football and Doctor Who themed glass jars. They also had a lilac personalised wooden crate arrangement, for the registrar's table and top table, which we filled with matching lilac and white wedding flowers. We think you will agree their flowers, theme and personal touches made one very special day. Congratulations Hannah and Nick! To see more photos of Hannah and Nick's gorgeous flowers, including professional photos from Rachel Clarke Photography check out our Wedding Flowers gallery. All the pictures on our website are from real Weddings, so if you want some further inspiration or would like to read our Bride's testimonials (like Hannah's below) then check out our Liverpool Wedding Florists website.